Scorsese brilliantly takes you to a place you wont soon forget. Made for fans of the Scorsese/DiCaprio combo, twisted psychological thrillers and nearly-perfect filmmaking. I have been looking forward to Shutter Island since the trailer first emerged last summer. When the October 2009 release date was pushed back to February 2010 – a move that usually signals a red flag of bad filmmaking – many critics lost hope in Shutter Island. They immediately presumed it to be a bad film. Through it all, I remained hopeful. Several friends had told me that the novel from which the film is adapted (written by “Gone, Baby, Gone” and “Mystic River” author Dennis Lehane) was their all-time favorite book. 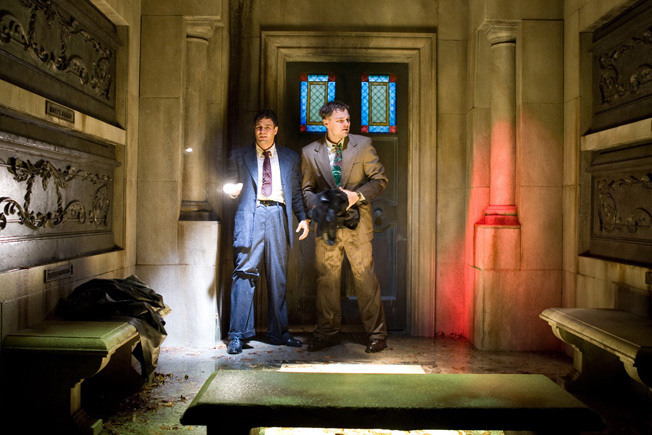 Prior to seeing it, Shutter Island was easily the 2010 film I looked forward to seeing the most – more than Iron Man 2, Robin Hood, Inception – anything. And after seeing it, even with my expectations at a super high, aside from one storytelling flaw, Shutter Island did not disappoint. Shutter Island is director Martin Scorsese’s fourth collaboration with actor Leonardo DiCaprio (the other three being Gangs Of New York, The Aviator and The Departed). In it, DiCaprio plays Teddy Daniels, a U.S. marshal investigating a case on Shutter Island – the home of Ashecliffe Hospital For The Criminally Insane. Teddy and his partner Chuck Aule (Mark Ruffalo, Zodiac) have been sent to the prison-like compound to assist in the search for a missing patient with a history of violence. But when a hurricane causes the two to become stranded and without communication to the mainland, they begin to notice something awry – secrets begin leaking, revealing Ashecliffe Hospital to be nothing what it seems. Even though my plot description of Shutter Island may seem simple, please note that I was only trying to be as vague as possible. I rewrote that paragraph several times, removing potentially plot-spoiling elements. As you may suspect, there are many surprises in Shutter Island’s highly complex story. The less you know, the more you will get out of it. I can’t urge you enough to see it soon before someone has the opportunity to ruin it for you. There is a huge misconception going around caused by the trailers and TV spots. Let me set the record straight: Shutter Island is not a horror movie. It is not scary. Shutter Island is a psychological thriller. As we watch the film, just as Teddy Daniels is trying to do, we, too, are trying to piece together the dark truths behind Ashecliffe Hospital’s shady secrets. That is it. There is no killer going around slashing up doctors, guards or patients. Yes, there are plenty of crazy people with violent pasts, but all we simply see is a story of a couple guys trying to find out what in the world is going on. Typically, a film as well-acted, directed, shot and edited as Shutter Island would be a perfect, five-star film worthy of an Academy Best Picture nomination. But there is a problem with Shutter Island. At the end of the film, there is an important scene of exposition (a scene that spells out everything to that point) that basically uncovers every single mystery to the film. Most complicated movies have these types of scenes; they bring the audience up-to-pace with the lead character. These scenes can be absolutely necessary in films; otherwise, the audience may get completely lost in the complexity of the story. But the expository scene in Shutter Island is over-the-top. As if the audience is too dumb to piece together EVERYTHING, it over-explains like a mallet to the head. The dialogue used and the manner in which it happens feels out of place. The characters involved in this scene even feel to be acting out-of-character, going against the grain of everything we have seen them do up to this point. The over-explanation pulls you right out of the film. But even with its flaw aside, Shutter Island is definitely worth watching. As I mentioned, every other aspect of the film is phenomenal. DiCaprio is not the only actor giving an Oscar-worthy performance. Michelle Williams (Brokeback Mountain), playing Teddy’s dead wife who appears to him in dreams, and Emily Mortimer (Lars And The Real Girl), playing the missing Ashecliffe patient, both give award-worthy performances. And those given by Ruffalo, Ben Kingsley (Gandhi), Patricia Clarkson (The Green Mile) and Jackie Earle Haley (Watchmen) aren’t too bad either. As always, Scorsese’s film is absolutely beautiful. There is a reason why DiCaprio praised the man at this year’s Golden Globes (if you did not see it, Google it): the look and tone of his work cannot be matched. He is a master at his craft. I have enough faith in Scorsese’s work that I am sure he could take-on an awful screenplay like Maid In Manhattan and turn it into a brilliant masterpiece. He has an eye unlike any other filmmaker. Every single shot of Shutter Island is stunning. This gift/knack adds a true depth and aesthetic nature to the intimate scenes that really count. Just as you might expect, “hats off” to long-time Scorsese Academy Award winning editor Thelma Schoonmaker, the film’s editor. In the same manner as she did with The Departed, Schoonmaker edited Shutter Island in an unconventional style that enhances the movie-watching experience. I may not have the words to perfectly describe the brilliant emotional pull that her editing creates, but I know it when I see it. It is said that good editing goes unnoticed, but in a few rare occasions I’ve noticed some untraditional forms of editing that work perfectly. Two of those times have been from films Schoonmaker has edited: first, The Departed. And now, Shutter Island. I hope that I’ve stressed to you how great a film Shutter Island truly is. I went in the very highest of expectations and had them met. You will be both entertained and awed – not only at the originality and complexity of the story, but at the precise and beautiful manner in which it was made. Its strengths highly out-weigh its weakness. Being the type of film that can only get better with multiple viewings, you can bet that I will be seeing Shutter Island at least one more time in theaters.